Are You Confused By The Conflicting Supplement Claims? You want to know whether supplementation makes sense for you and your family, but it is so confusing. On the internet everyone is an expert. How do you sort through the claims and counter claims? Who should you believe? What is the truth? Are supplements going to cure you, or kill you? Is fish oil good for you, or is it really snake oil? Are supplements a good investment, or a waste of money? Do you get all the nutrients you need from food, or not? Who benefits from supplementation, and who doesn’t? Manufacture products that are worthless or contaminated? Have no proof their products are either safe or effective? Manufacture products they know are dangerous? Make claims they know are not true? They lie to you. In his 40+ years of teaching medical students and public speaking, Dr. Chaney realized just how confusing supplementation was to the average person. He understands your confusion. He understands your pain. 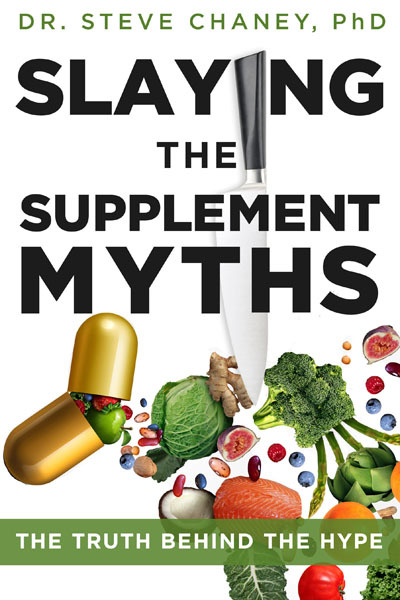 His mission is to cut through the hype and confusion and slay the supplement myths. He is dedicated to giving you the truth about supplementation. In this book he has searched the scientific literature to provide you with accurate answers to your supplement questions. He will guide you through the maze of claims and counter claims, so you can decide if supplementation is right for you and, if so, which supplement program that is best for you. He will also guide you through the hype, incompetence, and deception in the supplement industry, so you can choose supplements that are both safe and effective.